Our school will be closed for Christmas Break from Monday, December 18, 2017 through Tuesday, January 2, 2018. School resumes on Wednesday, January 3, 2018. We wish you and yours a beautiful Christmas season and New Year! We invite you and your family to attend Christmas Eve or Christmas Day Mass; multiple Mass times are available. Come home for Christmas to St. Mary, Star of the Sea! Our students will be walking to St. Mary’s church on Friday as we celebrate the Feast of the Immaculate Conception, a Holy Day of Obligation. All families are invited to attend Mass with their child; we will begin walking at 11:40am and attending Mass at 12:10pm. Should you not be able to make this time with your child, other Mass times are available. Why do we celebrate Mary’s conception? Church doctrine teaches us that God preserved Mary from original sin from the moment she was conceived; it was defined as a dogma of the Roman Catholic Church in 1854. You Shop. Amazon Gives Back. Do you shop on Amazon? We sure do! Did you know you can support St. Mary’s Parish with every purchase you make? Amazon donates a portion of every sale, at no cost to you, to any non-profit organization that you designate. CLICK HERE to set St. Mary, Star of the Sea Parish as your preferred charity/non-profit. 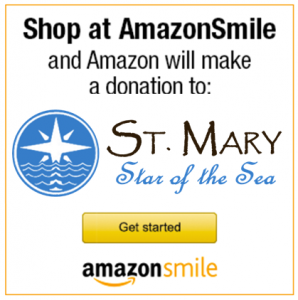 Then, the next time you shop, start at http://smile.amazon.com and know that (at no cost to you) .5% of your purchase is going to support St. Mary’s Parish! What could be easier? Our St. Mary, Star of the Sea Cub Scout Pack is selling Christmas tree and wreath as part of a fundraiser! These beautiful, fresh cut Christmas trees and handmade wreaths, swags and garland are available for pre-sale through November 14th. These trees are amazing and come directly from a farm in Oregon. The trees are so fresh that sometimes they are delivered with snow still on the branches! These trees are different than what you find at the tree lots in town or the store. They are nursery quality, premium trees, hand selected, cut, loaded and delivered within a few days and not sitting in storage for weeks before purchase. Already have an artificial tree, cannot pick up the tree, or you live out of the area? No worries, you can help support us and a military family! The Trees for Troops program gives a donated tree to a military family and we keep a portion for our fundraising efforts, it is a win-win for everyone. There are even wreaths and swag available for purchase should you not want a tree. If you plan to purchase a tree this year, please consider purchasing one to support our Scouts. Not only will you receive an awesome tree for your family to gather this Christmas, you are supporting our programs. Please view the attached flyer for information on trees, wreaths, and purchase details. Thank you!! We all cherish our family pictures, so please don’t miss the opportunity to capture this particular “moment in time” for your family. Whether you need a new family portrait for your Christmas card, a gift for your children’s grandparents, or a photograph on the living room wall, come make a memory with us here at St. Mary’s this holiday season. No purchase is necessary, however additional photo packages will be available for you to purchase for yourself or to give as gifts. Please allow up to one hour for photo session and viewing of portrait selections. We look forward to seeing you there! Due to the expected high temperatures in Oceanside, we will have a noon dismissal on Tuesday, 10/24. We will follow rainy day procedures for dismissal (parents will come to the classrooms to pick up their children). There will be no Star Care tomorrow afternoon. Thank you for your support in ensuring the safety of our students. If picking up your child at noon will be a hardship, you are welcome to pick them up at any time in the morning (before noon), or have them stay home for the day. If your decision is to not have your child attend school, please send in a note and the absence will not be counted. Please pray for those who do not have shelter and for those affected by the heat. All kids from 2nd Grade to 12th Grade are invited to join our Children Choir! We will sing at Mass once a month. The first Mass we sing at will be on Sunday, October 29th at 10:00 AM. Our Pastor would love to have your participation. Simply come to our first rehearsal on Wednesday, October 11th at 6:00pm, Children Choir Flyer 10-2017, and sing! PLEASE bring a ½” black binder to rehearsal to keep your music organized. We’d love to hear your young voice praise our Lord at Mass! Your child is invited to become an altar server at our Parish. It’s a wonderful way to have your child participate actively in the Mass, and be a witness to their classmates! To learn more about how your child can serve at the Table of the Lord, please see the Altar Server form or contact Amy Nelson at stmarysministers@hotmail.com. Don’t miss the Gently Used Uniform Sale Friday July 21st. from 10:00 am – 1:00 pm on campus. You may bring your gently used uniforms washed and in re-sale condition for credit towards your purchase. Current School Dennis Uniforms Only please. Come check out our inventory.